White: The color white is cleanliness personified, the ultimate in purity. White is totally reflective, awakening openness, growth and creativity. Very modern design ring "Square Wrap" looks stunning with whole simple white. Combination of white diamonds and white gold have been the standard of engagement ring. It represents purity and integrity. This set would be a favorite of many people, though it is rare. 9181.00 White gold engagement ring with yellow accent diamond and yellow gold bands with yellow accent diamond. Very unusual yellow gold bands. The yellow accent diamonds will glitter especially under the room lights, and it adds gorgeousness to the white diamond. 9732.00 The white gold with the pink accent diamonds made the sweetest engagement ring. The pink gold band makes the combination with the engagement ring sweet and elegant. Yet man's band with mahogany accent diamond and shows masculine elegance. 10135.00 The sparking blue accent diamonds around the white gold setting adds a cool and pleasant atmosphere to the white diamond in white gold. The blue accent becomes a nice key focus of this set, showing briskness and a sense of intelligence in the bride. 9732.00 The white diamond and white gold with blue accent diamonds make the engagement ring very stylish and unusual. The pink gold band decorated by blue accent diamonds makes the set contemporary yet elegant. The combination of white, blue, and pink is popular in other fashion, but new and very refreshing for a wedding set. 9732.00 The white diamond and white gold with purple accent diamonds, the pink gold with the purple accent diamonds makes a sweet set. While 401313 has pink accent diamonds, this set is surrounded by purple accent diamonds, which, adds some sort of magical atmosphere to this ring. The men's band is pink gold with white accent diamonds and it remain as modern and stylish. 8998.00 Green is a color of life and yellow is warm sunlight. This combination feels like a summer day in a green meadow. This is a happy and lively ring that also sets off the white diamond by surrounding it with color. 8753.00 The marriage of a unique white gold design with a vibrant yellow color diamond. For a cheerful and good-humored bride and groom who love sophisticated originality. The yellow diamond will look great with white dresses as well as with blue jeans. Yellow is the color of youth and new beginnings. 8830.00 The combination of yellow gold and white gold always brings gorgeousness to the jewelry. By combining the two colors of gold with a large yellow diamond and with yellow accent diamonds, it becomes even more gorgeous. The yellow diamond and the yellow gold band resonate with one another. They are a new type of contemporary look and perfect for the fashionable couple. 9381.00 This yellow gold engagement ring with a large yellow diamond and yellow accent diamonds is simply gorgeous. By combining it with the white gold band with yellow accent diamonds it is extraordinary. This gorgeous and unique set on your finger will attract everyone's attention. 9381.00 The white gold engagement ring with a large yellow diamond and pink accent diamonds is so adorable looking! By combining it with a pink gold band, the set becomes very pretty and stunning. The men's band has mahogany accent diamonds, and it looks contemporary and chic. You will definitely catch people's attention. 9784.00 Adding pink accent diamonds to this yellow gold engagement ring with a large yellow diamond. It becomes very unique. Combining with a pink gold band with the pink accent diamonds, this set is stunning. It is glorious and so joyful. The accent diamonds in the man's band is mahogany, and it looks contemporary and chic. Perfect for a happy and cheerful couple. 9784.00 This combination of a large yellow diamond and purple accent diamonds is simply stunning. With the modern and unique Square Wrap design, this unusual color combination becomes so beautiful, gorgeous, and so pleasant. It is perfect for a modern and fashionable couple,who loves a fun adventure and people's envious eyes. 8647.00 White gold engagement ring with a large yellow diamond and the mahogany accent diamonds. This is an adventurous color combination with a modern and chic atmosphere. By combining it with a pink gold band, the set becomes elegant and unusual. The accent diamonds in the man's band are mahogany, and it looks contemporary and chic. This is a variation of 402313 which has pink accent diamonds. With the mahogany accent diamonds, it has a little more composed. 8402.00 Yellow gold engagement ring with a large yellow diamond and mahogany accent diamonds. This is a stunning combination similar to 402323, which has pink accent diamonds. The mahogany accent diamonds make the set more chic, yet glorious and joyful. This gorgeous set is for the truly trendy couple. 8402.00 This marriage is of a very unique white gold design and a sweet pink diamond. The pink diamond will be a beautiful accent for the bride wearing an all white wedding dress. Or it is a perfect choice for the bride who chooses some pink accent color for her wedding. You might be the first bride who integrates the engagement ring color into her wedding color coordination. This ring makes you even more charming, even in everyday life. 11261.00 A large pink diamond and white gold with yellow accent diamonds is an unique combination. The yellow gold band with yellow accent diamonds makes this set unusual. This ring leads you into the adventurous world of colors. 11811.00 This marriage of very modern white gold design and sweet pink diamonds. Another variation of 403111, the little pink accent diamonds create a very charming effect to this sophisticated yet sweet set. The pink diamond is a beautiful accent for the bride wearing an all white wedding dress. It would be perfect for the bride who chooses pink accent colors for her wedding. You might be the first bride who integrates the engagement ring color into her wedding color coordination. This ring makes you even more charming, even in everyday life. 12791.00 Pink gold and white gold decorated by pink accent diamonds makes this very sweet engagement ring and band. You will feel romance and intimacy from this sweet color combination. The man's band is decorated by mahogany accent diamonds and shows a masculine elegance. 12215.00 A stunning combination of pink and yellow. It looks as if a piece of pink jewelry is set off by a yellow accent.... A large pink diamond, pink gold band with all these pink accent diamonds then this delicate yellow engagement ring... The man's band set with mahogany accent diamonds presents a masculine elegance. 12215.00 Sparking blue accent diamonds around the white gold ring adds a sophisticated and pleasant atmosphere to this white gold ring. The combination of the pink center diamond and blue accent diamonds is so refreshing and delightful. Isn't is perfect for a sweet and intelligent bride?! 11811.00 This pink gold band is decorated by the blue accent diamonds. By adding a little Blue to the golden color combination "Pink and White", the ring becomes very sweet, elegant, and also expresses a sense of freedom. To a sophisticated charming couple! 11811.00 This pink gold band decorated by mahogany accent diamonds, makes the ring quite classy. Even though only the color of the accent diamond is different from 403313, these 2 rings have very different images. While 403313 makes you feel sweetness and intimacy, this ring has an energy and elegance of a mature couple. 10832.00 The marriage of a unique white gold design and a refreshing, serene blue diamond.This noble and elegant ring would be perfect for a sophisticated couple. The blue diamond is stunning with the white wedding dress and also with everyday casual clothes. 8538.00 The large blue diamond and the white gold engagement ring with the yellow accent diamonds leads you into the adventurous world of colors. The combination of the yellow gold modern square band and the white engagement ring makes it very unusual, yet so gorgeous.The Blue and Yellow are complementary colors to one another, and such a combination makes a strong impression. This beauty is for a very special couple. 9089.00 A large blue diamond, white gold engagement ring with the pink accent diamonds makes a sweet and modern atmosphere. By combining with the pink gold band with the pink accent diamonds, it becomes very beautiful and pretty,but not too sweet.The man's band has mahogany accent diamonds while the lady's band has the pink. These are familiar colors - blue, pink, and white, yet very unusual in fine jewelry.This ring will attract envious eyes of all those around you. 9492.00 The yellow gold engagement ring with a large blue diamond and pink accent diamonds leads you into an adventurous world of color.Sky blue, sweet pink, and shining gold - we love all of them so much, yet we haven't seen the combination in an engagement set. Why has no one taken these colors into the most important and most joyous life event, marriage ?! It is full of joy and sparkling fun. 9492.00 A marriage of a very unique white gold design and a refreshing serene blue diamond. While 404111 has white accent diamonds, this set has blue accent diamonds adding more color but still simple and intelligent. The blue diamond is stunning with the white wedding dress. This set would be perfect for a sophisticate and fashionable couple! 9089.00 Much the same engagement ring as 404411, radiating unique sophisticated energy. These bands are yellow gold with blue accent diamonds in combination with a white gold engagement ring,this set takes you into the adventurous world of color. The Blue and Yellow are complementary colors to one another,and such a combination makes a strong impression. For this ring,it creates an unusual, yet modern gorgeousness. 9089.00 This combination of a large blue diamond and a white gold ring with blue accent diamonds makes a refreshing and modern atmosphere. By combining with the pink gold band with blue accent diamonds, this set becomes pretty, but not too sweet. Especially the blue accent diamonds around the wrap make the ring less sweet but even more unique, comparing it to 404313. 9089.00 You are now in an adventurous world of absolutely new and stunning color combinations.The white gold ring with a large blue diamond and purple accent diamonds makes an unusual yet refreshing atmosphere. By combining the colorful engagement ring with the yellow gold band with purple accent diamonds, it brings a dash of vintage style to this very modern ring set.It has an elegant energy and at the same time it has whimsical beauty, like you are strolling around the alleys in Paris. 8355.00 This is a marriage of a unique white gold design and a magical purple diamond. Purple is the color of ritual, cleansing, and connecting. Isn't it just perfect for a marriage and wedding ?! The purple diamond will look extremely impressive and unique with a white wedding dress and the full set with band is also stunning in everyday life. 9720.00 A marriage of a unique white gold design and a magical purple diamond. Purple is the color of ritual, cleansing, and connecting. The purple diamond will look extremely impressive and unique with a white wedding dress. While 405111 has white accent diamonds, this set has pink accent diamonds. The pink color adds sweetness to this set. The pink accent diamonds in the man's band is unusual, yet with this square design,it is very sophisticated and contemporary. Perfect for truly fashionable guy. 11250.00 The same engagement ring as 405311. The bands are made from the pink gold with the pink accent diamonds for the lady's, mahogany accent diamonds for the man's. Even though the color combination of purple and pink is rare in the fine jewelry world, both are healing colors and give you a sense of peace and joy. The combination of the large purple diamond and the pink gold is simply pleasant and very trendy. You are already in the adventurous world of color, but the rings feel safe and peaceful. Simply a gorgeous and magical set ! 10674.00 The yellow gold engagement ring with a large purple diamond and pink accent diamonds is unusual. You are right in the center of the adventurous world of color! The accent diamonds in the man's band are mahogany. For a courageous beautiful bride who has good intuition and fashionable sensitivity and a truly trendy and intelligent groom. 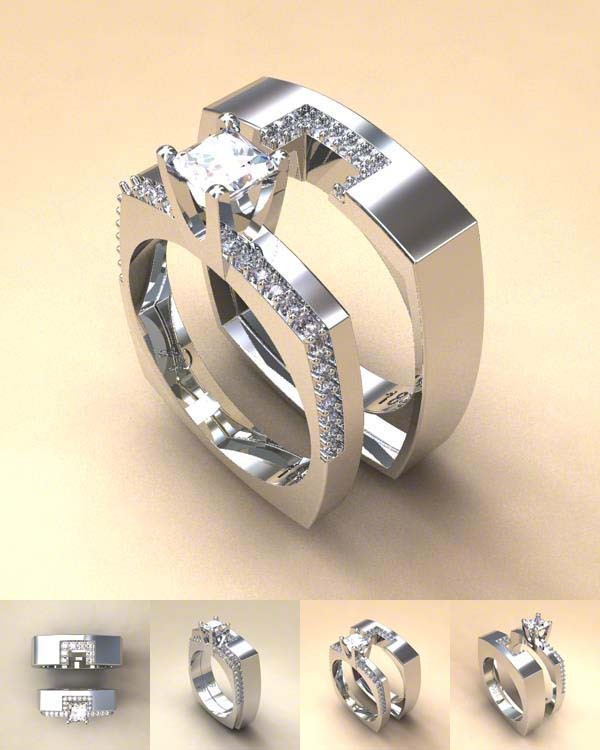 The ring will make a bride smashing and even more charming , not only in a wedding dress, but also in everyday attire. 10674.00 This is a stunning combination of a unique white gold design, magical purple diamond, with the refreshing impact of blue accent diamonds. Purple is the color of ritual, cleansing, and connecting, and blue here speaks freedom and creativity. You might not notice, but you are stepping into the adventurous world of color. The set is perfect for the adventurous, sensitive, and contemporary couple! 10270.00 The same engagement ring as 405411, but the bands are made from yellow gold. This luxurious use of these beautiful colors takes you to the adventurous world of color. The new color combination, purple, yellow, white, and blue, makes the ring playful yet exquisite. For a cheerful and curious bride who wants to explore the world of new beauty and an adventurous, yet intelligent and fashionable groom. 10270.00 A marriage of a unique white gold design and a magical purple diamond. All the diamonds used in the set are purple. Purple is the color of ritual, cleansing, and connecting. The ring is noble and elegant, yet it radiates a mystical atmosphere. For a curious and sophisticated couple who love true beauty and fun adventure. 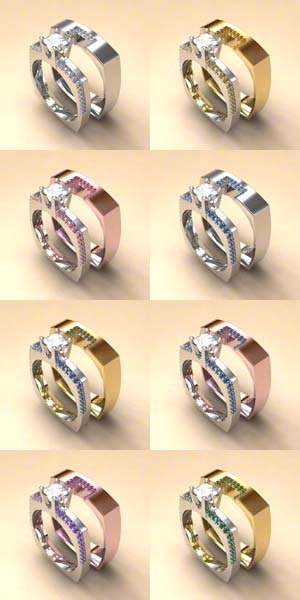 9536.00 The same engagement as 405511, yet the bands are made of pink gold. An engagement with mysterious purple diamonds is so charming with the pink gold band, yet the purple color makes the set not too sweet and brings a unique beauty to the set. Simply gorgeous and so different. You will receive extraordinary attention from everybody around you. 9536.00 This marriage of a unique white gold design and a warm mahogany diamond.Mahogany is a down-to-earth color and it relates to a quality like a comfortable home or loyal companionship. Even though the Mahogany color is sedate and quiet, the combination with white gold makes the ring beautifully simple and sophisticated.With the sparking white accent diamonds, the engagement ring alone or in combination with the band, they present a very unique beauty. 8352.00 The combination of a mahogany diamond and yellow & white gold isn't an unusual combination at all. But the Square Wrap design makes it so different.The yellow accent diamonds sparkle especially in low lighting and makes the ring delightful. The more you look, the more you love its uniqueness. 8903.00 Mahogany, pink and white..... have you ever seen such an exquisite color combination ? It is surprising how the colors mahogany and pink match magically and the set becomes unusually beautiful. The accent diamonds of the man's band are mahogany. This set is simply handsome and pleasant, yet so rare. 9306.00 Mahogany, pink, yellow..... this combination, which you probably have never seen before makes such a gorgeous ring . When wearing as a set, it looks similar to 406313, though this engagement ring is yellow gold while 406313 is white gold, both sets are unusually beautiful. The accent diamonds of the man's band are mahogany, while the lady's is pink. They are simply handsome and pleasant, yet so rare. 9306.00 The marriage of a unique white gold design and warm mahogany diamond. By adding the blue accent diamonds, the set becomes exquisite and so pleasant. Mahogany, blue, and white - you are in the adventurous world of color. Even though this is such an unexpected new color combination, the ring radiates a peaceful and comfortable energy. Are we feeling similar energies of wood and water....? The set is calm, yet it has its own unique beauty. 8903.00 The white gold engagement ring with a large mahogany diamond and blue accent diamonds, along with yellow gold bands with blue accent diamonds.The combination feels like some of the Native American, Navajo jewelry, which is made from silver, gold, blue Turquoise and brown color stones or leather. No wonder this color combination has comfortable and attractive energy. For a mature and down-to-earth bride and her man, both have strength and creativity. 8903.00 Mahogany, pink and white..... this combination, which you probably have never seen before makes such a gorgeous ring. The mahogany accent diamonds make the pink band closer to the mahogany color and the ring image becomes warm and comforting. It is an unusual color combination, yet it feels very natural and so pleasant. For a lovely bride with a beautiful heart appreciating honesty, sincerity and her special man. 7924.00 Mahogany, pink, yellow..... this combination, which you probably have never seen before makes such a gorgeous ring similar to 406323. The pink gold band makes the set so charming and the mahogany accent diamonds support the main diamond color, as a result the set becomes very gorgeous and beautiful. A mahogany color diamond can be so glorious and this is one of a kind in a gorgeous styled design. 7924.00 There are many green stone engagement rings with white gold and a green diamond. Probably because the green color is the energy of spring, renewal and rebirth, and makes us feel hopeful and bright. Among them, the Square Wrap design uniquely makes green so beautiful and special. A large green diamond looks stunning with white accent diamonds in the engagement ring and even more so with the white gold modern design band. In the set, the way the accent diamonds surround the green diamond is unique and sophisticated. This set is very simple, yet definitely beautiful and very rare. 8483.00 The combination of a large green diamond and yellow gold with white accent diamonds has an atmosphere of fine antique jewelry. When you wear it with the band, they turn into a unique, modern, and sophisticated set. In the set, the way the accent diamonds surround the green diamond is unique and sophisticated. And you still see yellow gold between the accent diamonds, which makes the set gorgeous. A Simple design, yet so beautiful and very rare. 8483.00 A white gold engagement ring with a large green diamond and yellow accent diamonds. The way these colors are used leads you into the adventurous world of the color. Since the color green is so spectacular, the color combination with yellow, and white makes the set joyful,radiating energy of renewal and rebirth. 9034.00 This combination of a large green diamond and yellow gold has an atmosphere of fine antique jewelry. The white gold band with sparking yellow accent diamonds makes the set very unique and dazzling, yet also modern and charming. The set radiates a positive energy full of joy. 9034.00 You are now in an adventure world of absolutely new and unique color combinations. The large green diamond is stunning in the white gold engagement ring with blue accent diamonds. The yellow gold bands have blue accent diamonds, which seems to be something new but also feels vintage. This is adventurous and fun. The unique color combination would attract everybody's attention around you. For a very charming and confident couple. 9034.00 A large green diamond with green accent diamonds makes such an unusual ring. It is still very clean and pure, yet the sparking green radiates a joyful energy and makes this ring very attractive and sophisticated. The straight lines of the green accent diamonds make an unusual and cosmopolitan look. Simply a handsome set! 8055.00 The same engagement ring as 407711. These bands are yellow gold, and combined with the engagement ring it is very interesting and unique. Since the color green is so spectacular, the color combination with yellow,and white makes this ring special and joyfully harmonious. It is an adventurous set, yet the three colors are radiating an energy of renewal and rebirth, and maybe perfect for a couple of this new era of color. 8055.00 This yellow gold engagement ring with a large green diamond and green accent diamonds has a vintage feel to it. Yet with the white gold band, it transforms to become a contemporary and sophisticated set. It means you could enjoy both atmospheres depending on the situation, by wearing only the engagement ring or wearing them as a set. The straight lines of the green accent diamonds makes an unusual and cosmopolitan feel. Simply a handsome set!